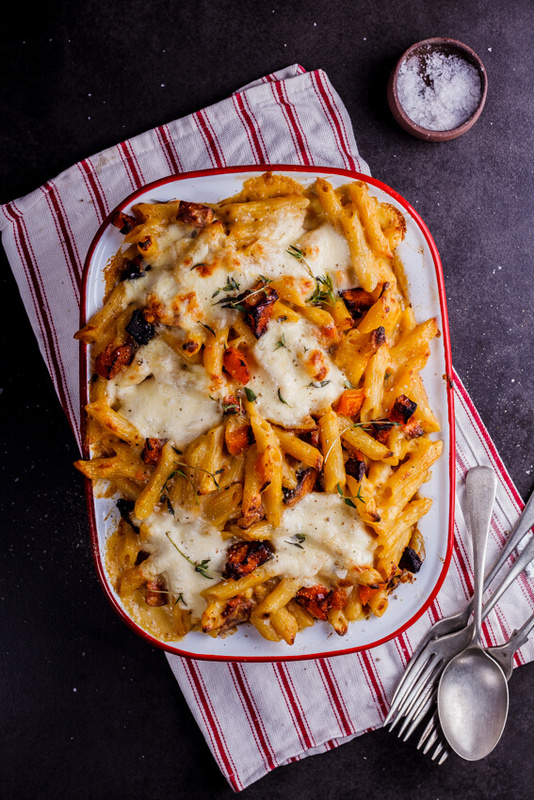 Creamy penne pasta bake studded with cubes of sweet, roasted butternut squash and chunks of buffalo mozzarella, flavored with fresh thyme. Yeah, so this is happening right now. 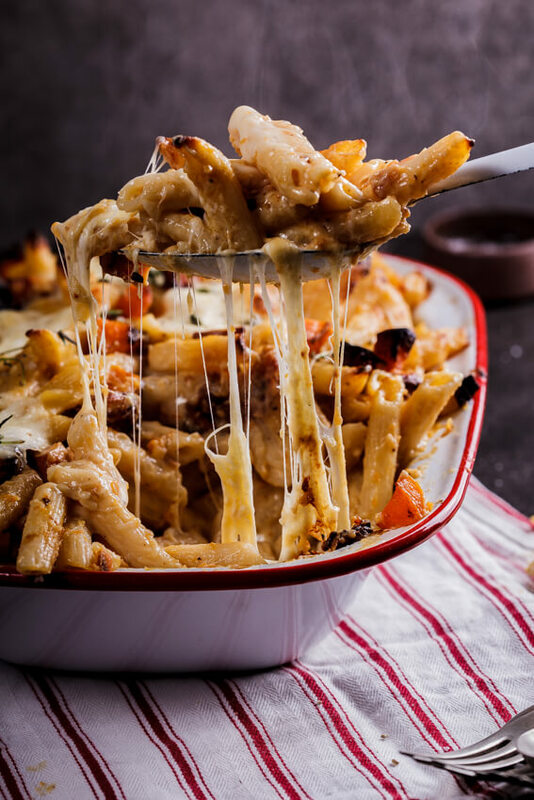 Allllll of that cheese and sweet roasted butternut and perfect pasta. All going down as we speak. Because did you know that left-over pasta makes for a great breakfast? Well, now you do. Because guys, this pasta was so damn good, not only have I cooked it a few times over the last couple of weeks but I’ve been eating the left-overs for breakfast and lunch just as often. Here’s where I get honest with you: I have a bit of a thing for risotto (all rice, really)/pasta leftovers. I love that they kind of go a little stodgy and I love that the flavours just seem so much more intense the next day. I know it’s weird but meh. It tastes sooo good. However, I wouldn’t blame you if you didn’t have any leftovers when making this because this pasta is seriously damn delicious. As we are pretty much fully in Winter in South Africa at the moment, recipes have two requirements: 1) Be warm and comforting and 2) Be flippin delicious. I mean, the latter is always a requirement but that first one. That first one is pretty big right now. May is usually a chilly but relatively mild month in Pretoria but this year it’s been bloody freezing and I love it so much. I don’t know if it’s because I was born right in the middle of winter (June babies UNITE!) but I can’t get enough of Winter. I love everything about it so I’m pretty much in my element at the moment. 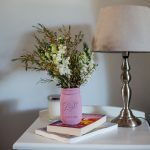 Cozy fires, fluffy blankets, lounging around in my winter dressing gown all morning (ahem), warm jerseys. LOVE! So yeah, there’s been lots of comfort food around these parts lately and I don’t see that stopping any time soon, in fact, as we speak I’m getting ready to prep for a pretty fantastic curry for dinner tonight. *drool* But back to this pasta. Butternut is without-a-doubt one of my favourite winter vegetables and I use it all the time. 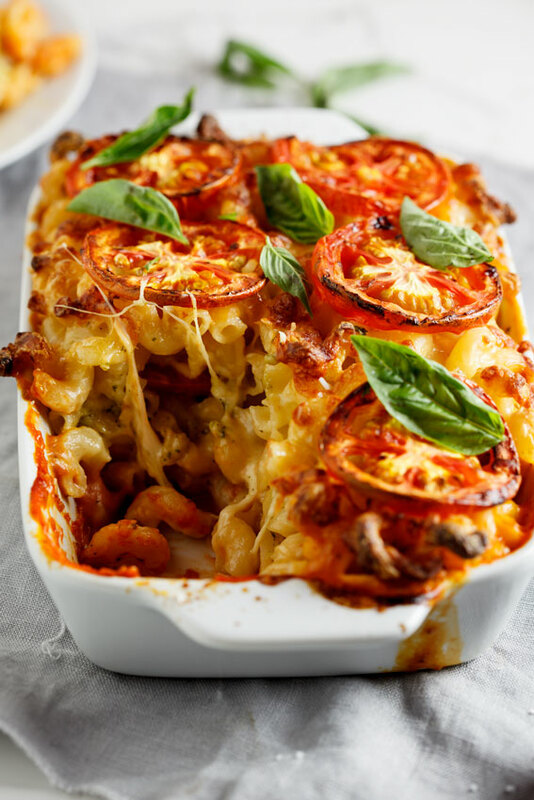 In everything from salads to fritters and pancakes and now in this ultra cheesy pasta bake. I mean, would you just look at that cheese? 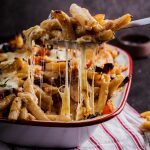 The actual pasta bake itself is really simple and involves making a quick bechamel sauce to which you add cooked penne pasta (but any short pasta shape will do), cubes of sweet roasted butternut squash and chunks of buffalo mozzarella. I mean. Bake it until the top is all golden and bubbling and the cheese is oozy et voila. Comfort food, done! Pre-heat the oven to 200°c and line a baking sheet with foil. Combine the butternut squash with the oil, honey, thyme and seasoning then transfer to the baking sheet. Spread the butternut out into a single layer then place in the oven. Allow to roast for 30 minutes or until the butternut is soft and starting to caramelise. In the meantime, melt the butter in a saucepan and whisk in the flour. Slowly whisk in the milk until it has all been absorbed, add the bay leaf then turn down the heat and allow to simmer, whilst stirring regularly, until the sauce is cooked through. Add the nutmeg and season to taste. 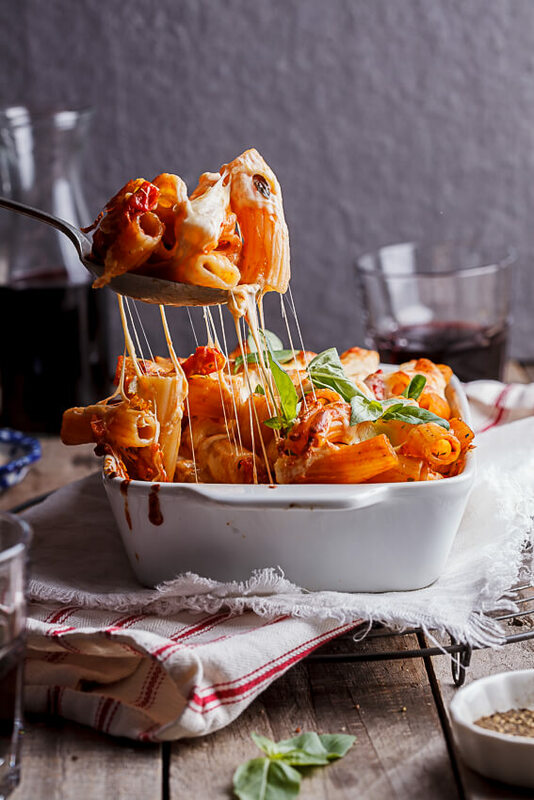 Combine the cooked pasta and bechamel sauce, adding a little of that pasta's cooking water if the mixture seems too thick, then stir in the roasted butternut and chunks of mozzarella. Top with fresh thyme sprigs, if using. Transfer to a baking dish then place in the oven. Allow to bake for 10-15 minutes until the top is golden and bubbling and the mozzarella has melted. Remove from the oven then allow to rest for 5-10 minutes before serving. This is gorgeous, and that cheese shot?! OMG! 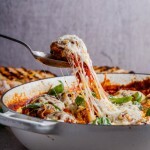 This looks so tasty, love all that gooey cheese! Glad you liked it. ?